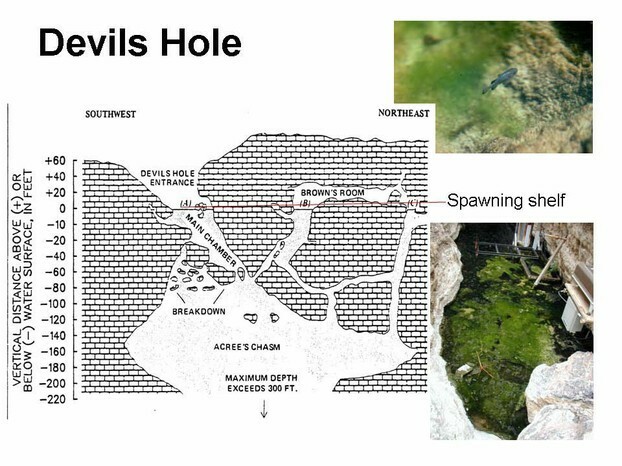 Devil’s Hole is located in the desert; near Death Valley. There is a crevice in the rocks where water has accumulated for centuries. A species that is not found anywhere else in the world lives here and are counted twice a year by the National Park System and conservationists. They are the Pupfish. The Pupfish live in this crack in the Earth that is not very wide and is very, very, deep. The divers have not found the bottom and they have gone down to about 436 ft. In the 1960’s two teenagers died while exploring Devil’s Hole. Their bodies were never recovered. 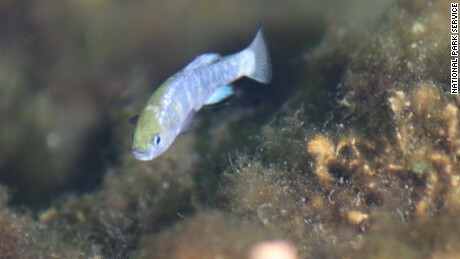 The Pupfish only live close to the top few “levels” of this 93 degree pool of water. They are blue and only an inch or two long. The people responsible for these fish count them every six months to make sure there are not less but more of this species. They can usually count the fish from the surface but the cave divers always want to know and see more. A thousand years ago the area was covered with water which is probably how this species got caught here. Devil’s Hole is an aquifer posing the farmers against the conservationists. When the pump was turned on the waters started receding which was detrimental to the Pupfish. A federal task force raised the alarm and a landmark case went to the Supreme Court in 1976,“The Farmers vs. the Fish.” “Nevada Pupfish Have Their Day in Court and Win” was the story which led to a lot of resentment from the farmers. So, barbed wire and cameras were installed so no one would throw in a bottle of bleach to kill the fish. As a back up in case something bad were to happen such as someone crawling over the fence and getting into the water, leaving beer cans and vomit as has happened, there is another facility that has the same environment about two miles from the original hole and the Pupfish are raised in safety. This cost $4.5 million and to save them some people feel it is just as important as saving the Bald Eagle. In an area that is so inhospitable to man they named it “Death Valley” these fish have survived.